• This item is custom-printed. • Colors may vary slightly from shown. • All sales are final. Orders can't be exchanged nor refunded. • We will contact you when your order is ready. Please allow 5-10 business days. • We ship all Orders for $8. • Or, Orders can be picked up at our Showroom during regular hours. We are open Tuesdays through Thursdays from 10am to 4pm. For this tee's chest width, the vendor measures the half chest across the front at a point 1" below each armpit. For body length, the vendor measures from the top of the shoulder to the bottom hem. 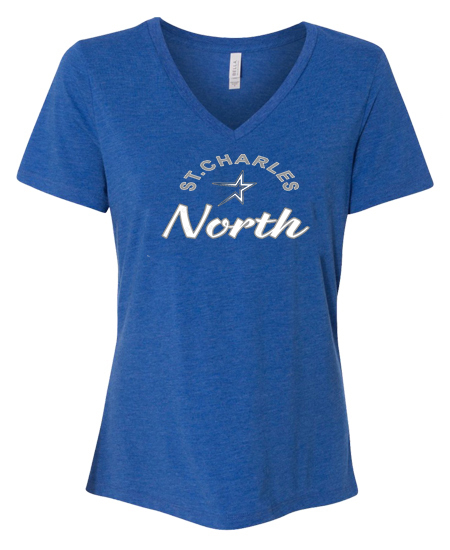 Lightweight, 100% combed cotton vee-neck jersey tee features a true relaxed fit and side seams.